Following our flow of comic news, we have something special for you now. 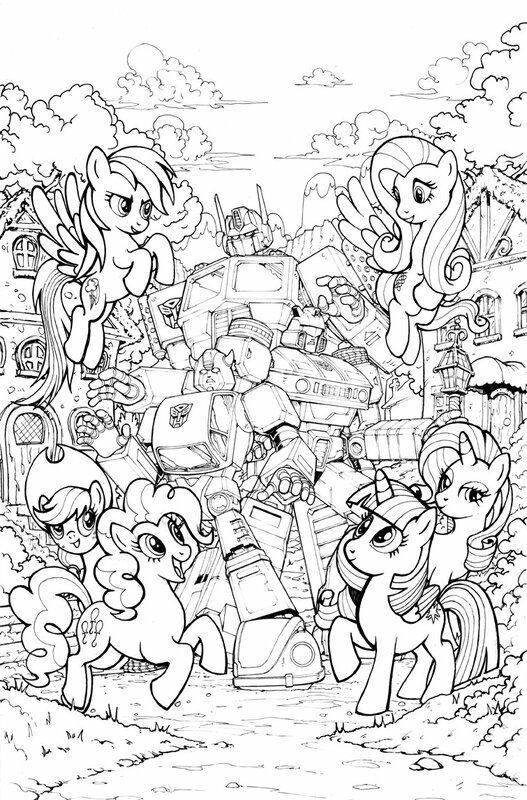 Artist Andrew Griffith has just shared images of an Unreleased Transformers & My Little Pony Crossover Cover And Line Art. 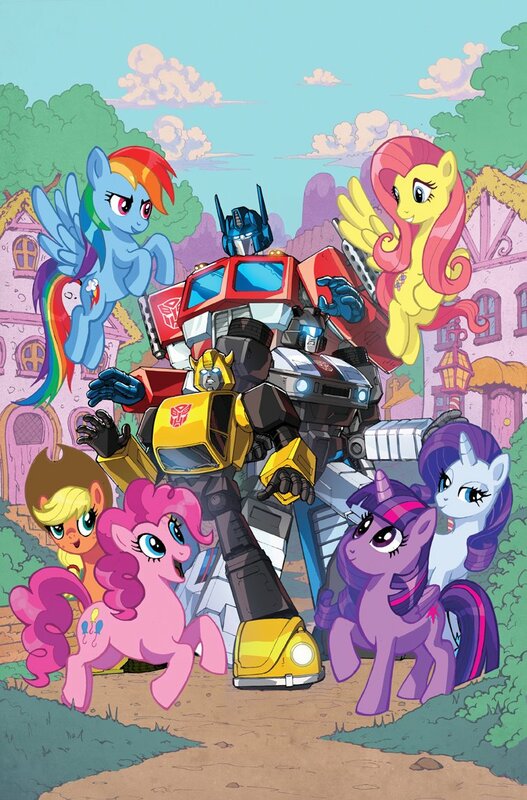 This is a curious cover featuring Optimus Prime, Bumblebee and Jazz surrounded by Twilight Sparkle, Applejack, Fluttershy, Rarity, Pinkie Pie and Rainbow Dash as they all seem to be at Ponyville. The perplex faces of the Transformers are unique. This was supposed to be a new IDW crossover comic, but it never saw the light in the end. The full clean color cover was revealed via Andrew Griffith’s Instagram and Twitter with colors by talented artist Priscilla Tramontano. Additionally, Andrew also shared the original clean line art of this unreleased cover via his Twitter. While we had seen a pair of special Transformers & My Little Pony covers back in the day, this is our first hint to a possible proper comic of this two franchises. Check out the mirrored images on this news post and then sound off on the 2005 Boards! Hahaha not my cup of tea but nicely executed. This looks bad. 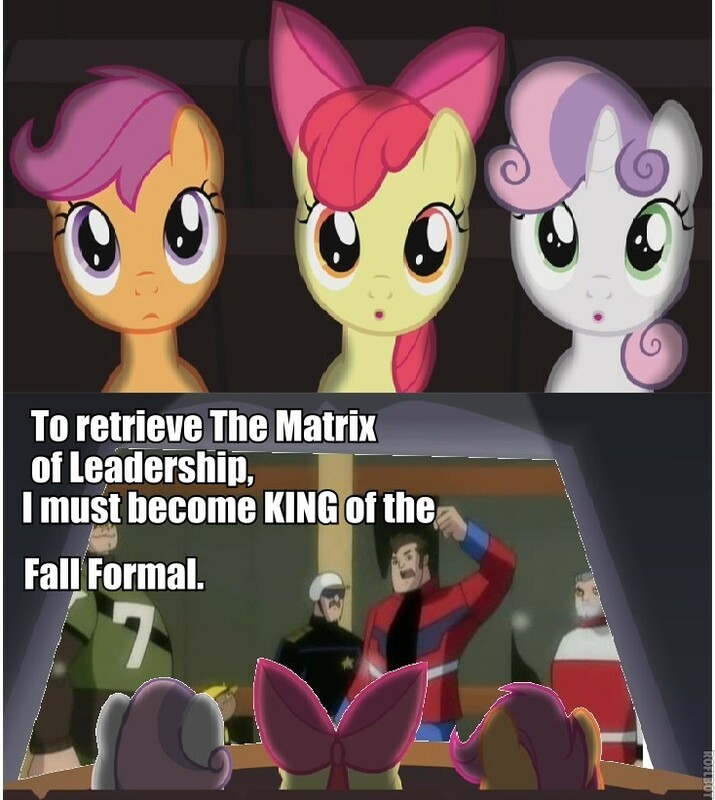 Now if it were Equestria Girls, Yeah I could see that; but not MLP. That OP picture makes my little daughter happy, and thus, I am happy. i still want this crossover to happen. i\'ve waited 9 years damnit! If you don't like this, then simply just ignore it. If others like it, let them enjoy it. Having the choice to indulge in something or simply ignore it allows everyone to win. How is anyone not "letting" other people enjoy this crossover? That seems to be the fault of IDW for not releasing it. You no longer enjoy something because some random people on a msg board don't like it? I hope the ponies cross over with Beast Wars instead this year. It would scale better. When HasTak agreed with Disney and IDW! Luckily this never came out. I hope the ponies cross over with Beast Wars instead this year. It would scale better. I imagine ponies would try to terraform and micromanage the environment of Cybertron, and try to unite the cybertronians under the magic of friendship. Maybe send Megatron to Tartarus (that is real in the show and like less than a day of distance from the place it takes place)? He may meet some interesting characters there. Nah, the fans were genuinely annoying a lot of the time. Here they more or less kept to themselves, but on other boards they'd be more bothersome than furries. Pretty much this. A lot of them still are. lol, it's been eight entire years since it came out and there are still people mad about the cartoon ponies? I'm a girl and I hate the ponies. The ponies don't even look good, they are off model and look like bootleg versions of themselves. So noseless, deformed and out of whack proportions? TF Animated or Prime it is! I remember seeing that on the mlparena. Always nice to see Moondancer and Rarity. I like the Autobots expressions of utter confusion. The styles clash a bit too much, if the transformers were rendered in the mlp style it'd look better. Not the first IDW Transformers/MLP cross-over, although I think I preferred the first! Is this the first time Andrew Griffith's drawn the FiM ponies? I wonder… If it was it's not half-bad! I've seen worse attempts when comics artists try that style. A crossover artbook would be cool. With G1 Shockwave on the cover. and in true transformers crossover fashion the ponies come to cybertron in hopes of annihilating the cybertronian race because this civil war threatens friendship or grimlock stepped on the pink one's cupcake shop or something…. They did it right, they didn’t realize it! Eww, Tom Scioli. A true crime against humanity.